5) прививать положительное отношение к здоровому образу жизни. Актуализация лексических навыков по теме. Итог урока. Задание на дом. Good morning! 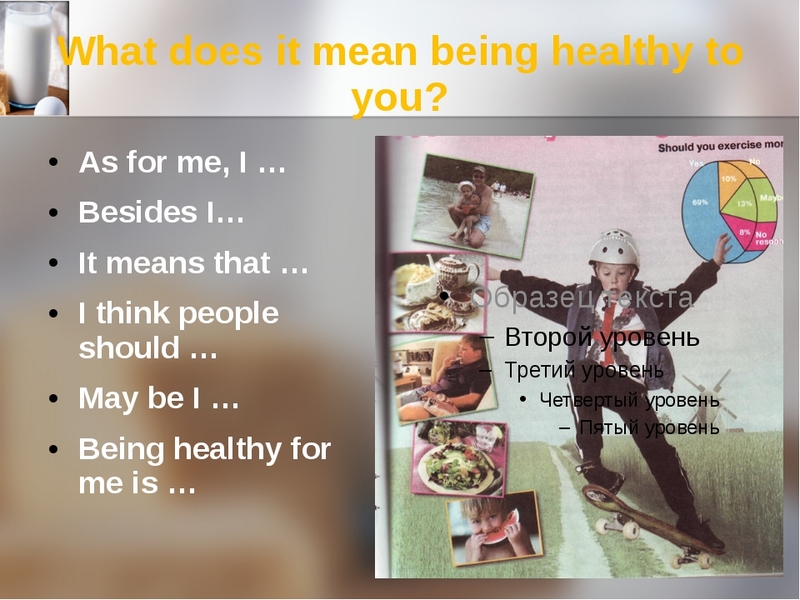 At our lesson we are going to continue working at our theme “A healthy lifestyle”. We shall discuss good and bad habits people have and we’ll learn some information about healthy food. At first answer my question, please. What should people do to be healthy and to keep fit? That’s right. And now I’d like you to remember proverbs and sayings about health. 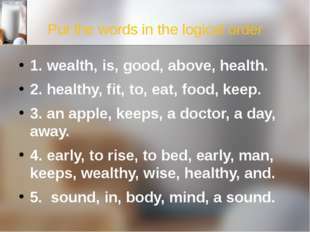 Look at the screen and put the words in the logical order. 1. wealth, is, good, above, health. 2. healthy, fit, to, eat, food, keep. 3. an apple, keeps, a doctor, a day, away. 4. early, to rise, to bed, early, man, keeps, wealthy, wise, healthy, and. Well done. Now look at the screen and complete the sentences you see there. 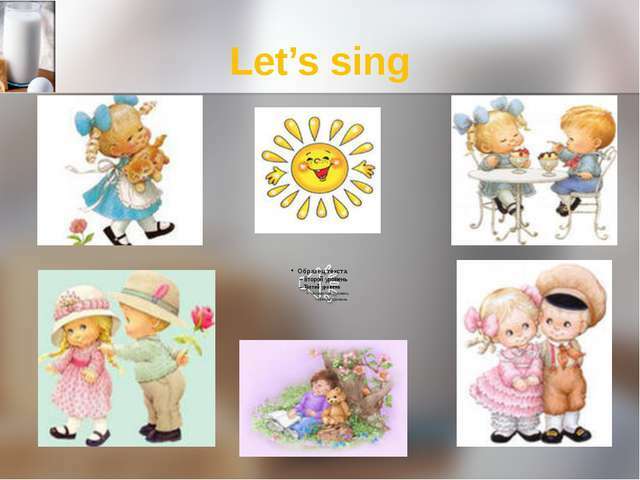 In your handouts you can find the words which you can use in your sentences. 2. … is really a good way to live. 4. … makes people strong and healthy. 6. … is dangerous for our health. eating a variety of foods; different diseases; smoking, drinking alcohol and taking drugs; limit; breakfast; sport; fast food. Bad habits are very dangerous for our health. They can damage our body and our mind greatly. 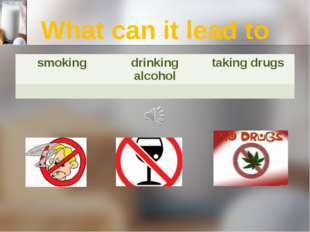 There are three main bad habits: smoking, drinking alcohol and taking drugs. People who smoke always have a cough. Their teeth are yellow and skin is unhealthy. Smoking often leads to a cancer of lungs. People who drink alcohol usually have a headache. Drinking alcohol is very bad for heart. Such people always have slow reactions, less memory and they are very aggressive. The most dangerous habit is taking drugs. 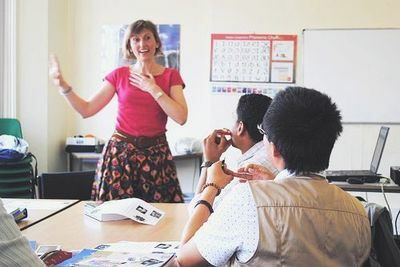 The beginners usually have unclear speech and slow reactions. They don’t live in a real world and like it. But then such people have blood and brain diseases. Taking drugs leads to the death. What are the three main bad habits? What does smoking lead to? What does drinking alcohol lead to? What does taking drugs lead to? To be healthy people should also have positive emotions. Music can help us to get them and to relax. Let’s sing! 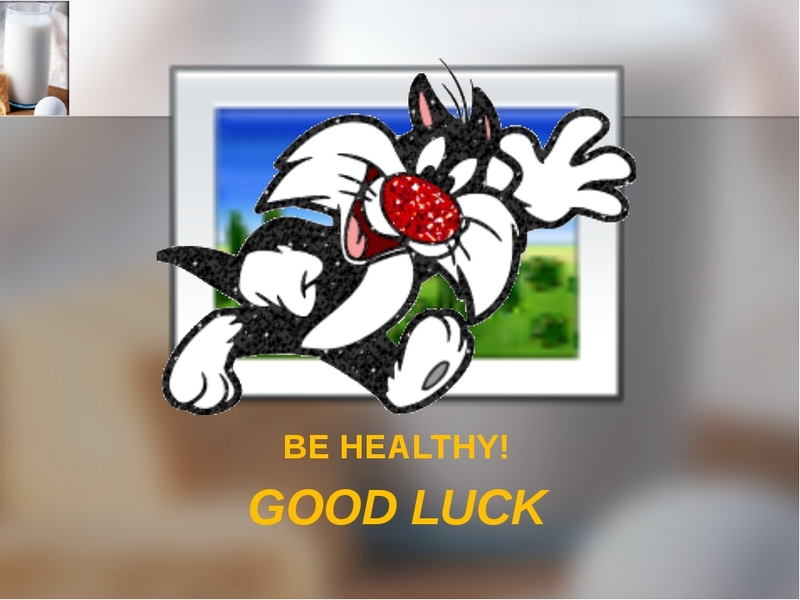 Now it’ time to learn some information about healthy food and do the test. Take your handouts and read the short text. Food gives us energy, makes us grow and helps to stay healthy. We need to eat something from all the food groups every day. Fruit and vegetables, grains (крупа) and potatoes, fats and sugar, meat and protein (белок) and dairy (молочные продукты). Fruit and vegetables give us lots of vitamins and minerals and help us grow and stay healthy. We should eat more fruit and vegetables every day. Potatoes and grains, like bread and rice, give us the energy we need. Half of what we eat every day should come from this group. Fats and sugars are things like oils (масло), sweets, biscuits, chocolate and ice cream. These foods give us energy and they are important for our nervous system. But too much of this food can make you fat and can be bad for your teeth. You should not eat more than two sweets or fatty things a day. Meats and proteins are foods like chicken, fish, duck, eggs, nuts and beans. 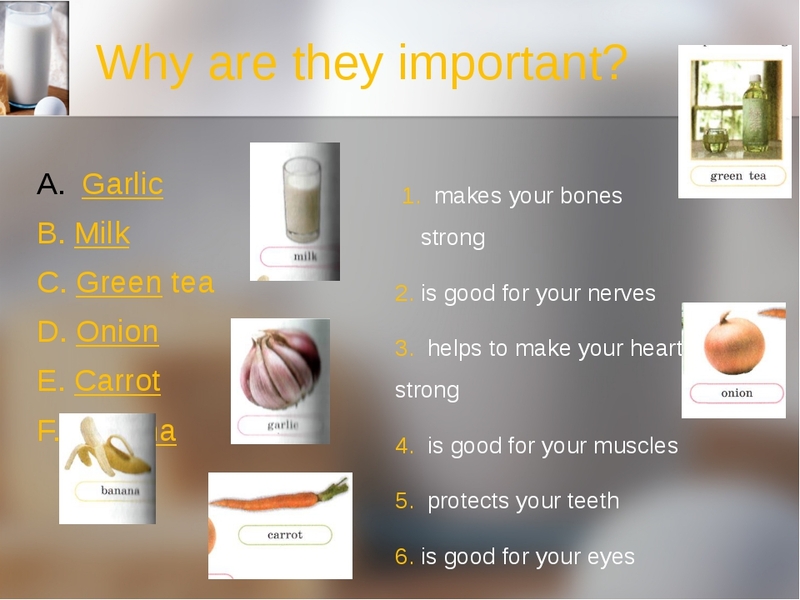 These foods give us important minerals and help us to build our bodies. We need to eat a little of this food every day. [ ] (кальций) which helps to make our teeth and bones strong. You should eat some of these foods every day. But you can also get calcium from dried fruit (сухофрукты). 1. Food gives us energy and makes us grow. 2. Sweets give us lots of vitamins and minerals. 3. cereals, bread and potatoes give us energy we need. 4. 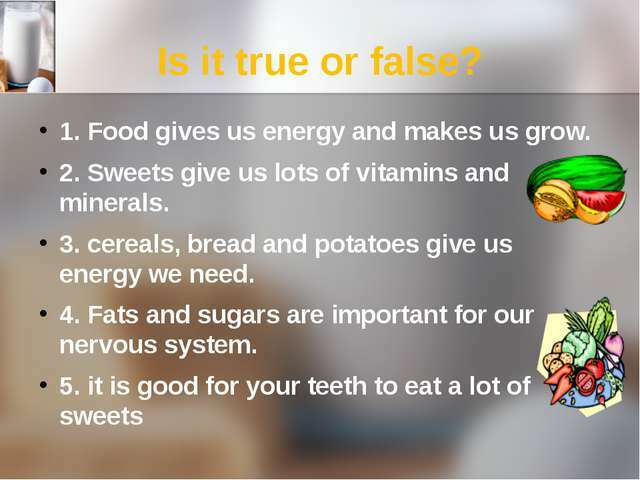 Fats and sugars are important for our nervous system. 6. You should eat a lot of chocolate. 7. Meat and proteins give us important minerals and help to be healthy. 8. 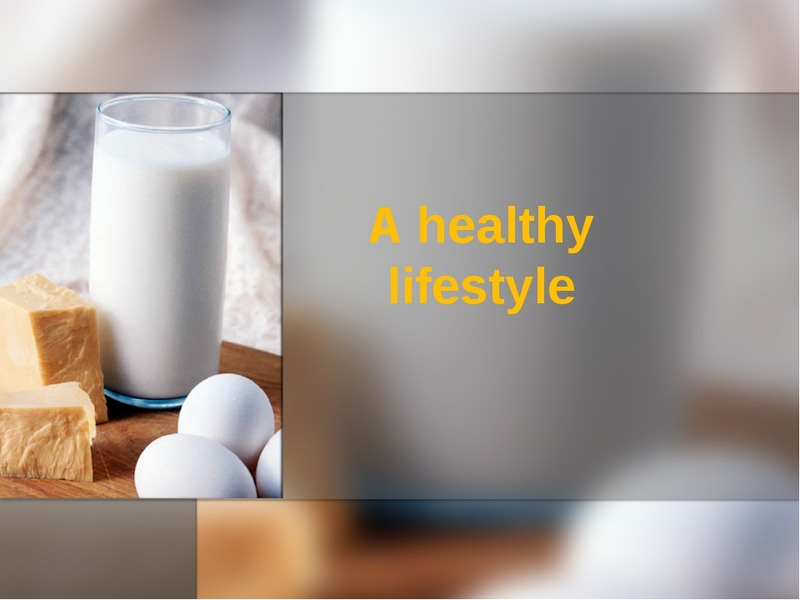 Dairy foods are things like chicken, fish and eggs. 9. 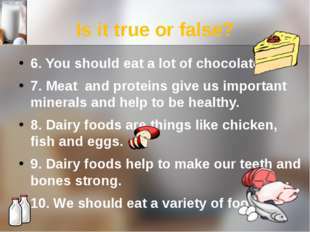 Dairy foods help to make our teeth and bones strong. 10. We should eat a variety of foods. This is Lynne a year ago. 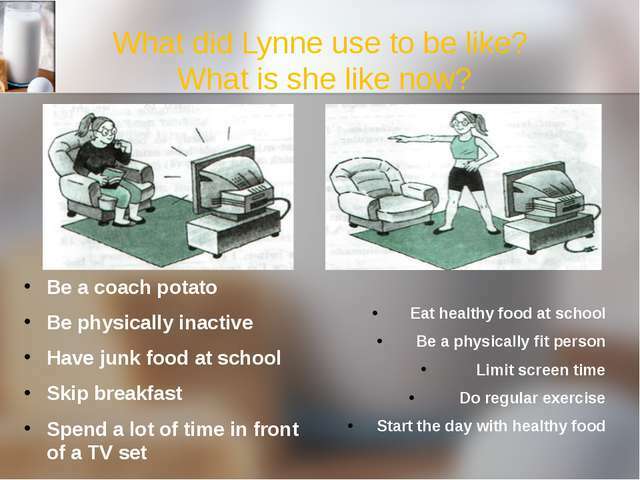 And this is Lynne now. What did Lynne use to be like? What is she like now? 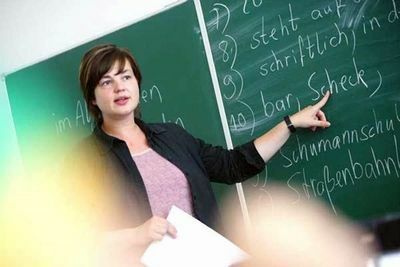 Use these words and word combinations. And what about you? How have you changed? Thank you for your good work. Now we know how to be healthy and to keep fit. Use the rules of being healthy and be healthy and happy. 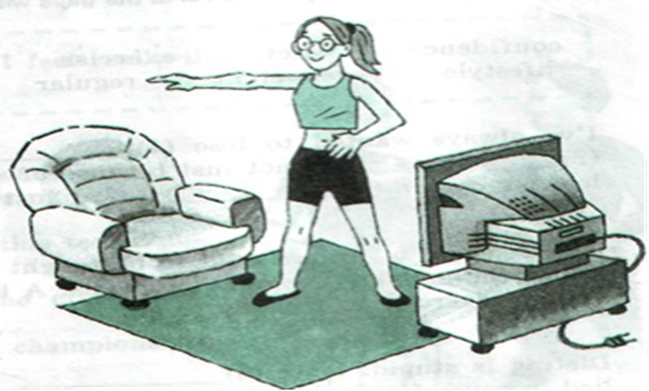 Your home task is exercise 2, page 66 in your Activity Books. Good-bye. 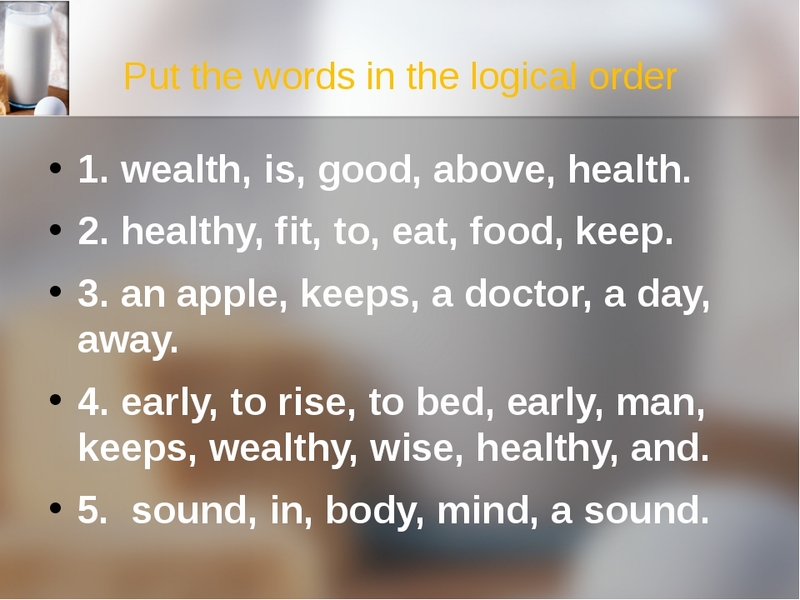 Put the words in the logical order 1. wealth, is, good, above, health. 2. healthy, fit, to, eat, food, keep. 3. an apple, keeps, a doctor, a day, away. 4. early, to rise, to bed, early, man, keeps, wealthy, wise, healthy, and. 5. sound, in, body, mind, a sound. 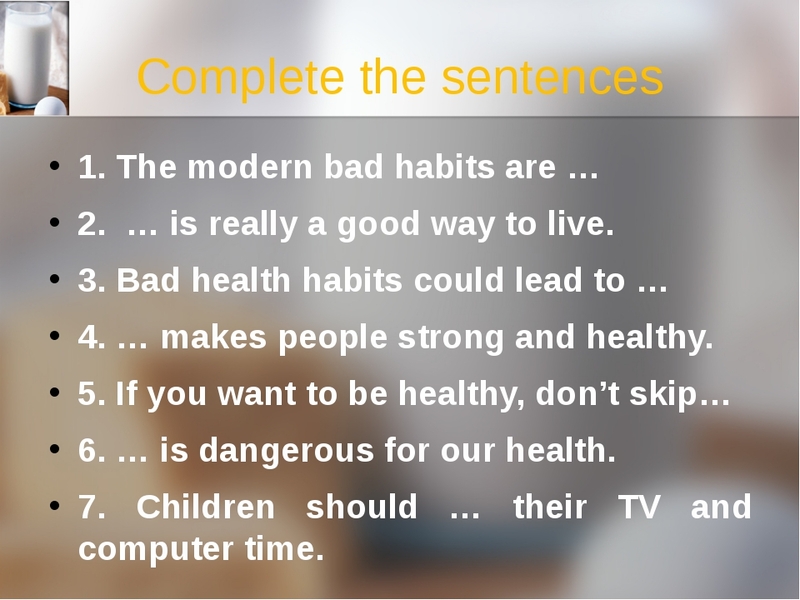 Complete the sentences 1. The modern bad habits are … 2. … is really a good way to live. 3. Bad health habits could lead to … 4. … makes people strong and healthy. 5. If you want to be healthy, don’t skip… 6. … is dangerous for our health. 7. 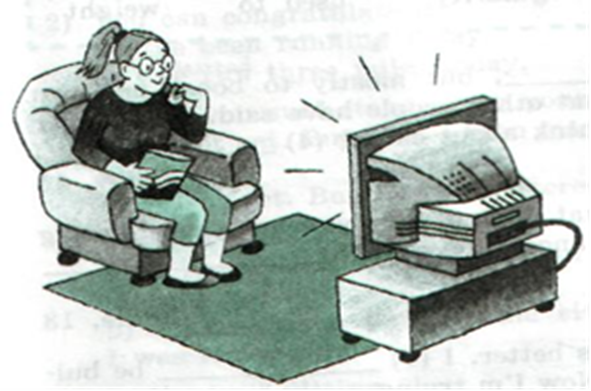 Children should … their TV and computer time. Is it true or false? 6. You should eat a lot of chocolate. 7. Meat and proteins give us important minerals and help to be healthy. 8. Dairy foods are things like chicken, fish and eggs. 9. Dairy foods help to make our teeth and bones strong. 10. We should eat a variety of foods. Конспект урока английского языка в 8 классе с презентацией на тему «A healthy lifestyle». Урок разработан по учебнику Кузовлева. Целями урока являются 1) повторить лексику по теме; 2) развивать навыки аудирования; 3) развивать навыки чтения; 4) формировать умение составлять монологическое высказывание по теме; 5) прививать положительное отношение к здоровому образу жизни. План урока. I. Организационный момент урока. II. Актуализация лексических навыков по теме. III. Развитие навыков аудирования. IV. Развитие навыков устной речи. V. Релаксационный момент. VI. Развитие навыков чтения. VII. Актуализация грамматических навыков. VIII. Итог урока. Задание на дом.